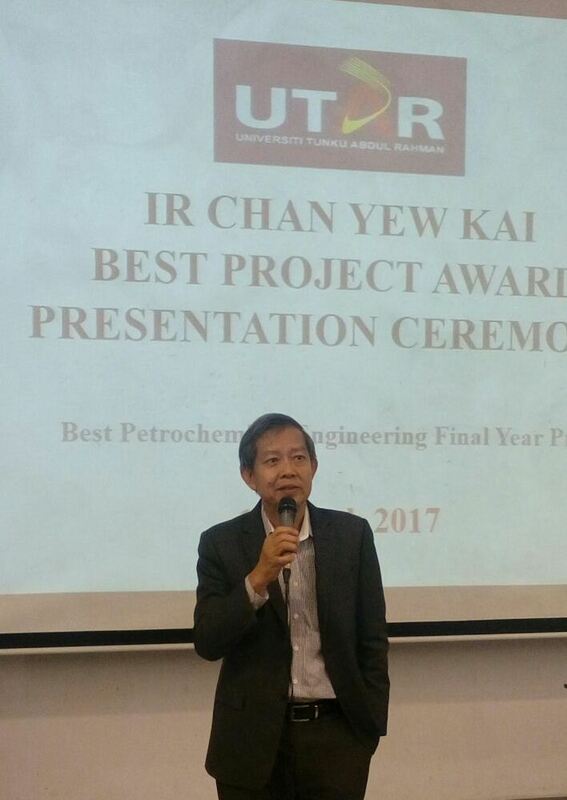 Faculty of Engineering and Green Technology (FEGT) Petrochemical Engineering graduate Kenneth Teo Sze Kai was presented the Ir Chan Yew Kai Best Project Award during a presentation ceremony at UTAR Kampar Campus on 1 March 2017. Also present at the ceremony were FEGT Deputy Dean for Academic Development and Undergraduate Programmes Dr Ng Choon Aun, FEGT Head of Department of Petrochemical Engineering Assoc Prof Dr Yamuna a/p Munusamy, FEGT Head of Department of Laboratory Management and Safety Administration Ir Dr Low Chong Yu, and other FEGT academics. The annual award was presented by Ir Chan, who is an Industry Advisory Panel (IAP) member of FEGT. 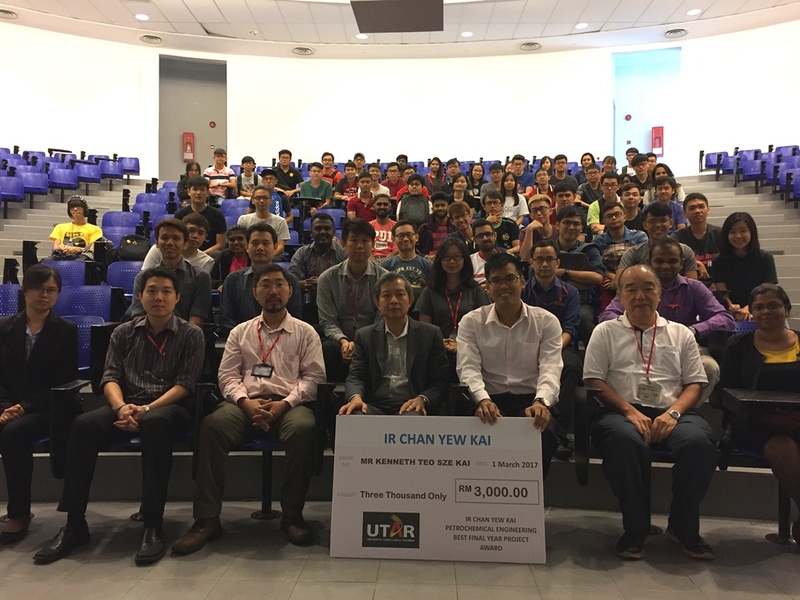 As such, the audience comprising FEGT staff and students also had the opportunity to be enriched by Ir Chan’s mini lecture titled “Practical Design in Industry”. The mini lecture underlined that plant design consists of important requirements and involves a multidisciplinary team such as process engineer, mechanical engineer, electrical engineer, construction engineer, interface engineer and so on. The role of petrochemical engineering students as process engineer is to provide detailed information on heat and mass balance, process optimisation and simulation while the piping instrumentation diagram provides the details on the overall process. According to the seasoned engineer, there are other considerations in plant design such as construction philosophy, maintenance philosophy and others. He then provided examples of cases caused by the omission of design which resulted in heat gain and phase, thus causing the failure of instrumentation and disruption of the entire process. “It is therefore very important to pay attention to the details when designing the plant when you’re in the industry in the near future. And after an overview on the overall consideration such as feedstock, product productivity, plant operation and maintenance, environment and costing, only then the final investment decision will be made,” he concluded. 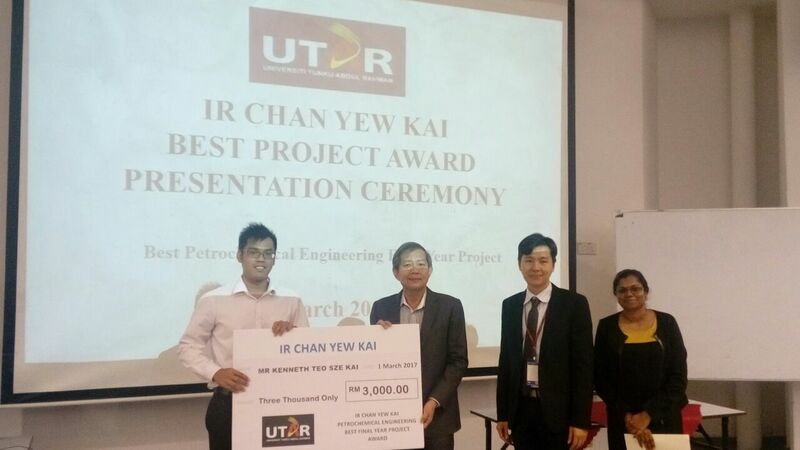 The mini lecture was followed by the award presentation in which Teo was rewarded RM3,000 as the recipient of the Ir Chan Yew Kai Best Project Award. 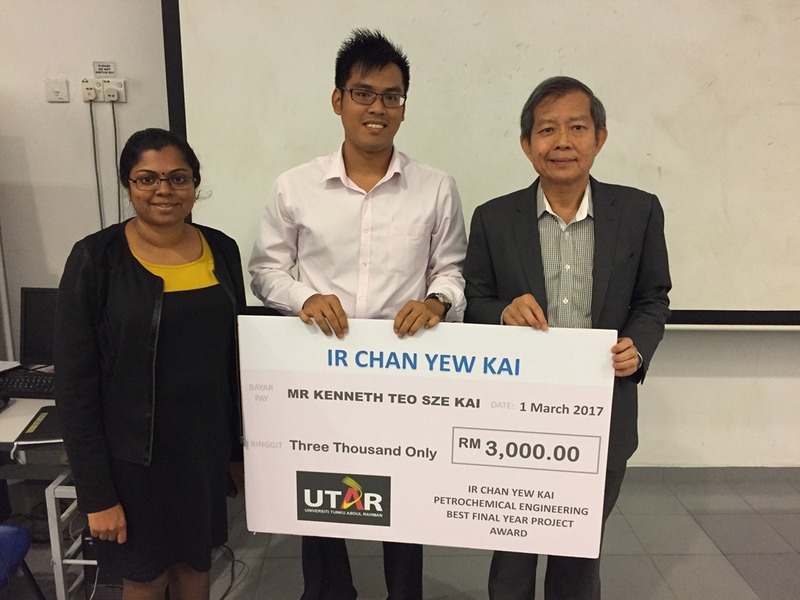 Graduating with an Honours Degree with Distinction, Teo expressed his gratitude as it gives him acknowledgement and confirmation on the effort put in for his Final Year Project (FYP). “This reward also gives me additional confidence and a starting boost to my career. 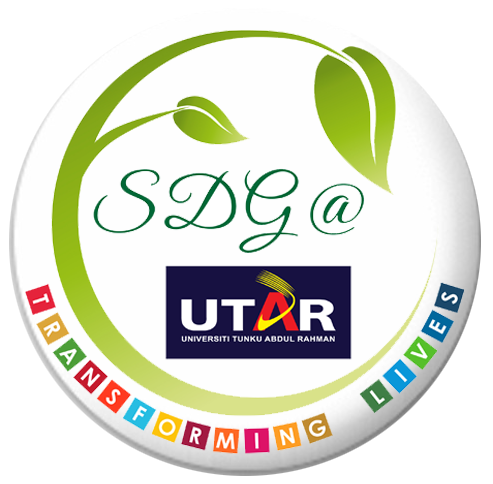 For the following batches of students doing their FYPs, the award will be a boost to their motivation in carrying out their projects more seriously and producing a quality thesis,” he commented. Titled “Fermentation of microalgae biomass through mild acid pre-treatment”, Teo’s FYP focuses on an alternative methodology to produce bioethanol from microalgae biomass, which is the mild acid pre-treatment procedure. “The main aim of the research is to determine if this method is suitable to be used to extract the carbohydrate content in biomass which will be fermented by yeast to produce bioethanol. The result of the experiment was a success and a high yield of bioethanol was achieved,” the Petrochemical Engineering graduate explained.